An unidentified rocket ship crashes into the Swifts' outpost in space and vanished before Tom can track it down. Shortly after comes the startling news that a Mars probe rocket, vital to the United States space program, has failed to respond to signals to bring it back to earth. Tom is confident that with his latest invention -- the Polar-Ray Dynasphere -- he can retrieve the stranded missile. But a web of espionage threatens his plan. A clue to the solution of the mystery prompts Tom to accept an invitation from the young Prince Jahan to visit his native land of Vishnapur in the snow-peaked Himalayas north of India. In this remote Oriental kingdom, Tom and his pal Bud Barclay visit a strange lake of death and sight the tracks of a weird monster said to prowl the lake at night. Tom conceives an ingenious plan for draining the poison lake with the Dynasphere mounted aboard his new spacecraft, the Dyna Ranger, so that the valley may be turned into valuable farmland. Fireball missiles and a hairbreadth encounter with a charging tiger are only two of the perils that confront the daring young inventor in this colorful, thrill-packed adventure. The main invention in this book is the Polar-Ray Dynasphere. The Dynasphere, which has to be one of Tom Swift's most far-out inventions, was built by Tom simply to retrieve an errant space probe sent to Mars by the Government. It seems that the government hadn't learned its lesson from their Jupiter Probe missile (see Tom Swift and his Electric Hydrolung) and had sent out yet another space probe devoid of radio gear. This time they weren't as lucky as they were with their Jupiter probe and the Mars probe missile got stuck in an orbit around Mars. The government thus wanted Tom Swift to invent a way to bring it back to Earth, and Tom, being Tom, obliged. A device stood on the bench in front of Tom. It consisted of a round plastic base with slender brass rods sticking up to support two spheres of quartz crystal, one inside the other. Two coils were mounted, one above and one below the crystal globes. From the lower coil, wires were connected to various points on the outer sphere. A thick cable led from the base to a portable electronic console. "Ah! It will be most rewarding to see the latest invention of the famous Tom Swift Jr.!" said a thick-haired student named Rakshi. 'This isn't an invention yet," Tom said. "I just rigged it up to carry out some experiments in the area of electromagnetic radiation." He explained that he had constructed the device to control and change the shape of electrical fields. "This is done by the anti-inverse-square-wave technique I developed in making my megascope space prober." Tom said that the technique could focus waves into a beam of constant signal strength, instead of allowing them to radiate outward in all directions. "Now, I'll demonstrate it," said Tom. A number of electroscopes were placed about the room. These were glass jars, each with a metal rod passing through its sulfur stopper. Every rod had a metal ball on top and two thin gold leaves hanging at the bottom inside the har. Tom took a plastic wand with a metal ball on one end and put an electric charge on the ball by touching it to a high-voltage terminal. "Of course you all know what will happen when I bring this near the electroscopes," he said. Tom held the wand near the ball of each electroscope in turn. In every one, the gold leaves swung apart as they became similarly charged and repelled each other. "As you see, the ball has to be very close to the electroscopes because its field is so weak. But now watch what happens when I place the ball inside my field distorter." Tom separated the crystal globes and inserted the metal ball. Then he twirled several tuning knobs on the console. As he aimed the globes at each electroscope, its leaves swung open! "Amazing!" Prince Jahan murmured. "Your device has focused and beamed the ball's electrostatic field as far as ten yards." "Yes, and with a more powerful machine, the range can be almost unlimited," Tom said. He now showed the model he had taken to the space outpost. Its inner sphere contained a mixture of helium, neon, and argon gases and was plated with silvery metal strips. As Tom switched it on, the gas glowed with a bluish-red radiance. "This model produces its own field, so there's no need to insert a charged object. The inner sphere can be rotated on any axis, making it unnecessary for me to aim the device by hand." Tom explained that by shaping the electric field into parabolic form, he could make use of its ability to reflect electromagnetic radiation and have it serve as an antenna. The young inventor demonstrated this by turning on a portable TV set. He tuned his device to the proper frequency and the screen promptly went black. When Tom turned off his device, the picture appeared again as clearly as ever. A student spoke up. "The electric field drew in the whole picture signal so that none was picked up by the TV antenna -- is that it?" "Right," Tom said. "And now for an even more interesting experiment. As you know, white light is made up of a whole spectrum of colors -- red, yellow, green, blue, and violet. I'll tune the field to trap light waves of the frequency green -- and watch what happens to the overhead lights." Everyone stared upward. The lights began to darken and take on a reddish-purple hue. Suddenly they went out completely! Even the daylight flooding in through the windows faded. In a moment the room was plunged into pitch-blackness except for the glow from the sphere! "Hey!" Bud cried. "What's happening?" An alarm siren shrilled across the plant grounds. Tom worked frantically to correct the trouble as the room filled with the smell of burning insulation. Full light was finally restored. "I'm afraid my experiment misfired. Instead of trapping light of one wave length, the field pulled in a wide band of frequencies -- the whole visible spectrum." "And in doing so blacked out the whole plant?" Rakshi asked with a supercilious smile. Next day the young inventor plunged into work on his idea for retrieving objects in space. Bud dropped by the laboratory to watch the experiment. Tom was just switching off a vacuum pump connected to a thick-walled glass chamber. Inside the airless chamber, a metal-plated Ping-Pong ball hung from a nylon cord. "What's this--a new game?" Bud asked. Tom chuckled. "No, a demonstration of how I hope to bring back that Mars probe rocket." Hmmm. Give me the low-down, Prof."
"Well, lets pretend that the Ping-Pong ball is the rocket," Tom began. He switched on his newly repaired electrostatic-field device and trained the inner crystal globe toward the glass chamber. Instantly the ball swung toward Tom! "Say, that's neat, boy. How does it work--by magnetic attraction?" "No, you might say it turns the ping-pong ball into an electron-drive engine." When Bud looked blank, Tom explained that the field beamed out by his device, in effect, polarized the ping-pong ball, making its front side highly positive. "Sort of a polar-ray beam, eh?" "You could call it that, I guess. Anyhow, the electrons in the metal coating, being negative, are driven toward the rear side. And since the ball is in a vacuum, the electrons jet out freely at high velocity." "I get it!!" Bud exclaimed. "The ball is driven forward by reaction--just like a jet-propelled plane of a rocket!" Early Monday morning he flew to Fearing with Bud, eager to see his creation. Viewed from the side, the new spaceship looked like a fat, tilted crescent moon -- its horns pointing up and back. The lower horn extended far aft to form the tail of the craft, with a huge crystal sphere mounted at the stern. Atop the upper horn was a bubble-observation dome, while the pilot's window looked out from the forward bulge of the crescent. "She's a beauty, Tom!" Bud commented. He pointed to several dish-shaped antennas mounted on the ship's "spine" along the inner curve of the crescent. "These are the repelatron catchers?" "That's right. And the rocket -- or whatever other space object is retrieved -- will be held right here, inside the fuselage, with the magnetic grapples to keep it in place. "Got a name for her yet?" Tom smiled. "Well, as you know, that double-walled crystal sphere at the stern is my electrostatic-field device. 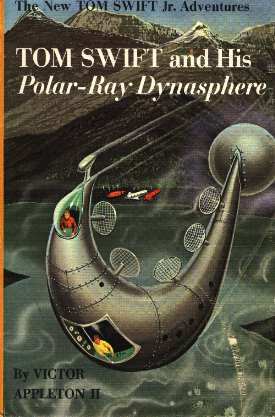 I've decided to call the gadget a 'Dynasphere' -- or 'Polar-Ray Dynasphere,' thanks to you, pal. Remember you used the term 'polar-ray beam' when I was demonstrating this device?" Bud was enthusiastic. "It's a real dream ship, skipper! ÖDid you say you're going to turn it over to the government after you retrieve the Mars rocket?" "Yes, Bud. It'll be used for salvaging dead satellites and other space junk." They climbed to the observation dome and Tom began setting a row of dials on the Dynasphere's control console. He explained to Bud that he was feeding their orbital position and that of the satellite into a sighting computer. "That will automatically aim the electrostatic field." One of the minor problems Tom Swift had with this invention (he always seems to have minor problems!) was the pulse problem. It seemed that the invention of his sent out the electromagnetic field in "squirts" instead of a steady stream. Tom managed to fix it, of course (I believe he jiggled with the oscillator or something), but the whole situation does bring up some interesting questions. Why, for example, would he have that problem? Was he emitting some sort of a beam or ray that caused an electromagnetic field? And how does this fit in with his initial claim that the machine "absorbed" radiation? And one last note: if you turn to page 133 of this book, you will notice that Tom Swift wore a spacesuit while inside the Dynasphere. It seems that, whenever inside one of his spacecraft, Tom Swift always wore a spacesuit. Why did he always do this? Couldn't he design a life support system adequately enough so that he could forgo spacesuits? The whole matter always struck me as odd. Just who, exactly, was responsible for this oversight? Perhaps the code for science fiction books of the 60's demanded people wear spacesuits even if they were inside a spacecraft. If so, this was an awfully shortsighted code -- the men in the Space Shuttle and Mir, after all, go about their daily business in everyday, normal clothes. What were students from Vishnapur doing at Swift Enterprise anyway? Well, it seems that Swift Enterprises had its own "foreign aid" program. Their idea was very simple: a group of people from a small, neglected, third world, underdeveloped nation were brought to Swift Enterprises to train in different scientific fields in hopes they could return to their native countries and modernize things and "raise their living standards". There is no clue as to how effective this policy was, but it was an interesting idea, at any rate. One interesting thing to note about this was that Swift Enterprises had done work in underdeveloped countries before. Kabulistan (see Tom Swift and his Triphibian Atomicar), for example, was helped enormously from help given by Asa Provard and Swift Enterprises -- factories were built, schools were erected, and power plants were built. Tom Swift also did his bit in Africa, when he built his amazing Repelatron Skyway (see book #22). Just what was Tom Swift Sr. doing with his bionics experiments? This book very casually lets drop the fact that Tom Swift is working on some "bionics" experiments. For those of you who don't know, the field of bionics busies itself with trying to enhance biological life by implanting man-made machines that can be implanted into living things and used by the organism as if they were part of him. A good example of a bionic piece of equipment would be an artificial eye that was capable of giving a completely blind person sight. "ÖA little. I was using my new gadget as a wave trap or antenna to capture light of a single wave length from certain stars so I could study their red shift." "Red shift?" Bud winked at Ken. "What's that -- a new Russian football play?" Tom chuckled. "No, a shift in wave length tells us whether a star is moving toward or away from the sun." "You still have not told us, Tom," Jahan said eagerly, "what you meant by a giant burning lens that works on electromagnetic principles." "Remember the electrostatic field device that I demonstrated?" Tom replied. "I told you the field can be shaped to serve as a reflector for electromagnetic radiation. Well, by lofting my device into the sun--and by shaping the field with just the right amount of curvature--I'm sure I can beam down enough infrared radiation to vaporize the whole lake." "Bud, Swift Sahib, the lake is large," said a student named Tundup. "To evaporate o much water would take vast amounts of energy." Tom began to jot down some quick calculations. "Let's take five hundred watts per square centimeter as the power density I will focus on the lake surface. Now then, assuming the volume of the water in the lake to beÖ"
In a few moments Tom had the answer. "By a conservative estimate, I should be able to boil away all the water in about six hours." "But will not more water be welling up all the time from the underground river?" "Not if I plug the inlet first," Tom replied quietly. "After the water has been vaporized, I can clean out all the poisonous sediment and plant growth with a machine of mine called a Spectromarine selector. Then I'll remove the plug and allow the lake basin to fill up again -- with pure, fresh water." "How high are we going, skipper?" Bud asked. "Just high enough for a good angle with the sun," Tom replied. "This should do it," he added a few moments later. Setting the controls, Tom started up to the observation dome. Bud followed. Topside, Tom sighted the sun's altitude, took bearings on the lake, then fed the information into the dynasphere's aiming computer. Tom's fingers moved back and forth over the electronic console, flicking switches and twirling voltage controls as he connected the dials. Presently the ship's great crystal sphere glowed bluish red. Tom tuned it to infrared frequency. A vast, curving electrical field began to deflect solar heat rays onto the lake. "Okay," Tom murmured tensely. "Now break out the electronic binoculars." Within minutes whisps of vapor could be seen rising form the lake's surface. The boys gazed down in fascination. The wisps became spouting columns of steam, roiling the lake into a seething cauldron. In an hour the valley was almost hidden under the billowing vapor clouds. Finally Tom said, "My father has radioed that I'm needed back in America for the Mars rocket project. But a fresh crew of engineers is on their way here. While the lake bed is being cleaned, they'll lay pipes and dredge irrigation channels so the valley can be turned into farmland without submerging these buildings." Tom's Spectromarine Selector, by the way, cleaned the buildings. "Öused the dynasphere's field to spot the base's radar search pulses and also to trap them so that they would get no reflection from us." How feasible is it to build a Dynasphere? I find the entire concept completely impossible. Here we have a device that can project electromagnetic fields millions of miles, and still have enough force to bring a rocket back to Earth all the way from Mars -- and in only 40 days, too! The principles of such a device are mind-boggling. Perhaps, if one knew enough about the true nature of electromagnetic fields, light, and radiation one could hazard to build it, but I have very, very serious doubts -- especially about the absorbing part. I could almost imagine a field that would block out selective rays of radiation -- but absorb? I have my doubts. True, there aren't really any physical laws that prevent this from being done, but how does one do it? Defense: The Dynasphere has enormous defense capabilities. It could be the ultimate weapon -- not only would it incapacitate the enemy, there is also no defense. Imagine this: a whole division of enemy tanks is heading for Alaska. What do we do? Simply turn on our Dynasphere and completely -- and I mean completely -- black out the area. No one in the tanks would be able to see what they were doing. Even if they had LED displays it wouldn't help -- the Dynasphere would completely block out all light! No one would be able to flight. This could also be useful if Earth was ever attacked by a hostile alien power -- we simply turn on our Dynasphere and none of the Martians would be able to see what they were doing. This weapon would be completely devastating -- not even infra-red or ultraviolet light would help, as every frequency of light would be completely blocked out. Stealth: The Dynasphere would be the last word in stealth technology. Simply load one onto whatever you wanted to radar-proof and you've got a complete radar shield. The shape of your plane -- the proximity of your ship to radar -- none of this would matter anymore. In fact, you would only need one of these per squadron; after all, you only need one to completely absorb every radar impulse the enemy could generate. Invisibility: The Dynasphere could be used on any spacecraft as the ultimate cloaking shield. No camera or instrument could possibly see you, for the simple reason that you would be absorbing every single light ray in your immediate vicinity. As no light was hitting you, you would appear perfectly black -- and thus match the backdrop of space. Satellite Retrieval: The Dynasphere was designed for this, and it could prove excellent at it. If you send up a satellite and it malfunctions, simply send warm up your Dynasphere and retrieve it -- even if it is in deep space. One wouldn't have to worry about space debris anymore; just send up a Dynasphere to vacuum the heavens. Also, maybe -- just maybe -- this could be used to retrieve asteroids from the asteroid belt, thus giving Earth yet another moon. Terraforming: The Dynasphere could be used to terraform the Earth in many, many ways. Tom already demonstrated its ability to boil away lakes; I'm sure the same technique could be used to remove swamps as well. However, the Dynasphere could really prove its value on another planet -- say, Mars. One of the first things scientists figure is necessary to terraform Mars is to warm up the planet. With the Dynasphere, this is made a simple task. All you would need is a couple Dynasphere's positioned in deep space relatively close to the sun. Once they are in place, have them adjust their electromagnetic fields to pinpoint solar radiation on Mars -- I'm sure you could heat it up enormously in very little time. Maybe, after the technology is perfected, a single Dynasphere could be put in orbit around Mars and used to keep Martian temperatures at an Earthlike seventy degrees Fahrenheit. Ö"A valve to plug the inlet." "A valve?" Bud echoed. "I don't see any hardware in that gunk." "Not a metal valve. This is a colloidal solution of very fine particles that will set, or coagulate, into a gel." ÖThis time, the setup on Tom's workbench consisted of a tall glass cylinder with a purple plug inside, about halfway down from the open top. Two insulated wires were connected to the plug through the glass wall of the cylinder. "Let me guess," Bud said. "This is your valve and it's made out of that purple jelly." Tom chuckled. "Right. But it's harder than jelly. I've named it 'electrogel.'" "Okay. How does it work?" Tom poured some water into the cylinder. It seeped quickly through the purple mass, which appeared to be porous. Tom opened a petcock at the bottom of the cylinder and drained off the water, then said, "Now watch what happens when I send a current through the plug." He closed a switch and poured some more water into the cylinder. This time, the electrogel had become impervious to the water. Not a drop seeped through! Bud watched in amazement. "Say, that's quite a trick! What's the secret?" "The electricity polarizes the colloidal particles in a way that opposes any infiltration of water molecules." Bud blinked and grinned. "Great! That tells me nothing, but I'll take your word for it." Tom explained that a huge quantity of the electrogel could be compressed into a small steel talk or cylinder for easy handling and then released underwater at the Lake of Kali inlet. So, in short, Tom took his electrogel, released it near the inlet of the lake he wanted to plug, let it disperse throughout the liquid, and then turned on a current of electricity. The electricity then caused the colloidal solution to solidify, creating a very effective plug. How just feasible is electrogel? I don't know. Someone might be able to cook up a batch of chemicals with the needed properties, but I suspect that there is more to this than meets the eye. Besides, what uses could it possibly have? This strikes me as a one-time invention created to solve a one-time problem. I could be wrong, but I honestly do not see any possible uses for an electrogel. There is one other invention mentioned in this book, and that is Tom Swift's "electronic binoculars". The binoculars were only mentioned in an offhand way, but they were mentioned several times and they got me to wondering. Binoculars, by definition, have nothing to do with electronics. They are mechanical devices, pure and simple, built out of two curved pieces of glass. How in the world could one make a pair of electronic binoculars? There's nothing there to electroize! Maybe -- just maybe -- they were a modification of Tom Swift's Megascope Space Prober. If you'll remember, this device used radio waves to paint a real-time picture of any object anywhere in the universe. Perhaps Tom Swift adapted this invention to serve in the capacity of binoculars, thus giving the power of a telescope to an ordinary pair of binoculars, and maybe the author forgot to mention it. If I have missed any inventions or if there is any information you would like to see on this page please let me know. Update 5/3/2002: A person by the name of Paul sent me this information. It looks like Tomís electrogel was not so far-fetched after all! a google search with: electrorheological fluids also turns up a number of interesting URLs.